How Much Can You Make in a Healthcare Administration Career? What Courses Can be Taken for an Online Healthcare Administration Degree? A career in healthcare administration can lead to exciting, fulfilling employment in hospitals, correctional facilities, primary care medical practices, and nursing homes. Healthcare administration graduates can find themselves in a variety of roles wherein they might improve clinical care, manage employees, or conduct market research on the healthcare field. 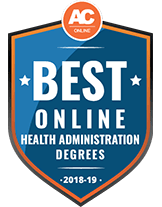 Healthcare administration majors take courses in management, accounting and budgeting, human resources administration, and strategic planning, all of which easily lend themselves to fully online instruction and learning. The following guide covers a variety of topics prospective students should consider as they explore online bachelor’s degrees in healthcare administration. From benefits, job outlook, and salaries, to curriculum and concentration options, to financial aid guidance, we provide essential information for any potential online student. We explore potential career paths you may take upon completing your degree, plus which kinds of tasks those jobs entail and how to prepare yourself to compete in today’s modern healthcare industry job market. See below our ranked list of the best health administration degrees online. While compiling this list, we considered graduation rates, tuition costs, the overall availability of online courses, and student resources for both on- and off-campus learners. The list includes accredited programs that offer career-advancing credentials and increase graduates’ earning potential. We also chose programs that provide diverse course options, opportunities to develop specializations, and the flexibility to tailor your bachelor’s in healthcare administration to fit your academic needs and career aspirations. University of Central Florida offers an online Bachelor of Science in Health Services Administration. Students in this 120-credit program will take core courses such as Long Term Care and Administration and Fundamentals of Health Information Technology. Students may choose to minor in aging studies, health informatics and information management, health sciences or public administration. To graduate, students must hold a minimum GPA of 2.5. Graduates can apply their degree in positions such as a health information manager, health services administrator or nursing home administrator. At Independence University, students may enroll in a Bachelor of Science in Health Services Management online. This degree can be completed in 38 months and provides students with the information and skills necessary to land entry-level or mid-level positions in the health care management field. Students who enroll in this 180-credit program will take various business and health care courses that focus on topics such as health care management, long-term care administration and information technology. Graduates of the program may go on to work as hospital administrators, health care facility operations managers or directors of a health care department. Brigham Young University-Idaho is an ideal option for those looking to earn a degree in health administration. To prepare prospective students for a career in this field, the school offers a Bachelor of Science in Health Care Administration, which can be completed online. After finishing all program requirements, graduates will have the knowledge and skills to work as managers or administrators of various health care facilities or to pursue a graduate level degree. The 120 to 122 credits in this program include courses such as Managing Health Care Provider Organizations, Research Methods and Program Evaluation, and Healthcare Strategy. Students who hope to earn graduate degrees after completing this program are encouraged to take several elective courses, such as Professional Presentations and Managerial Economics. University of Alabama at Birmingham has designed a Bachelor of Science in Health Care Management that can be completed online. It can prepare students for mid-level management roles in various health care environments, such as hospitals, long-term care facilities and home health care companies. To enroll in this program, students must hold a minimum high school GPA of 2.5. Once students are enrolled, they can choose from five degree options: the general manager track, clinical manager track, long-term care administration track, pre-professional track or occupational therapy or health informatics fast track. University of Minnesota Crookston gives students the chance to pursue a Bachelor of Science in Health Management fully online. This program was established to help high school graduates land entry-level health care positions and provide those who already work in health care with the knowledge and skills they need to advance their careers. The 120-credit program includes courses such as Health Care Leadership and Planning, Performance Improvement in Health Care and Decision Making in Health Management. Students who graduate may find careers working for hospitals, clinics or government agencies, and they may also take the Minnesota licensure exam for nursing home administration. Florida International University gives students the opportunity to earn a fully online Bachelor of Health Services Administration. This program prepares students to become effective managers in various health services environments in today's high-tech and multicultural world. This degree includes 120 credit hours of courses such as Quality and Evidence-Based Health Care Services, Health Care Organizational Behavior and Resource Management and Legal Aspects of Health Care. To enroll in this degree, prospective students are required to submit their official high school transcripts and ACT or SAT scores. Students can earn an online Bachelor of Science in Health Services Administration with an emphasis in Health Services Administration at Weber State University. This program includes courses that focus on topics such as interpersonal skills, decision-making, leadership theory and organization design. Students who enroll in this degree are required to complete courses such as Professionalism in Health Care, Human Resource Development and Computer Applications in Health Care. To be considered for the program, prospective students must hold a minimum high school GPA of 2.75. After graduation, students often find employment in clinics, nursing homes, rehabilitation centers and hospitals. University of Wisconsin-Stevens Point offers an online Bachelor of Science in Health Information Management and Technology. It is one of the only programs that focus on health information management and health information technology. Students who choose the health information route will focus on human resources, strategic planning and financial management. Those who opt for the health information technology program will learn how to build and use software and hardware systems to improve patient care. Admission requirements include approximately 60 credits of transferable college credits with a minimum GPA of 2.0, official college transcripts and prerequisite courses in communications, biology and college algebra. Winona State University allows students to earn a Bachelor of Applied Science in Health Care Leadership and Administration. The curriculum includes courses related to communication and relationship management, leadership, professionalism, knowledge of the health care environment and business skills. To graduate with a Bachelor of Applied Science in Health Care Leadership and Administration, students must earn a minimum GPA of 2.5. Students who complete this program are prepared to work as leaders in the allied health field. Bellevue University offers an online Bachelor of Science in Health Care Management for those interested in an administrative career in the health care industry. This degree is 127 total credits and includes courses such as Health Information Technology, Human Resources in Health Care and Marketing Health Care Services. The program also involves a capstone project that allows students to explore a topic in healthcare management in a specific organization. For acceptance into this program, prospective students must hold a high school diploma or GED. After graduation, many students pursue careers in health insurance and managed care, financial management, and health information technology and medical records. Online health administration degrees create opportunities for a wide array of careers. Students acquire highly employable skills in these programs, including analytical, interpersonal, communication, leadership, and technical skills, coupled with specialized knowledge in the healthcare field. This positions students for successful careers in both the public and private sectors. Students have no guarantee of landing a particular career or salary after graduation, but healthcare administrators can expect a positive job outlook. The U.S. Bureau of Labor Statistics projects that positions for medical and health services managers will increase by 20% by 2026. 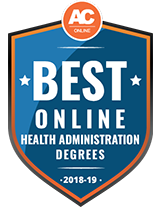 Below, find a list of common careers for professionals with online health administration degrees, plus the positions’ median salaries and descriptions of the day-to-day responsibilities they entail. These professionals work as office records-keeping specialists and information technology managers. In most cases, they work in medical offices, clinics, and hospitals. From day to day, they follow organizational procedures to update patient records and enter new medical information into a computer system. They ensure these files are secure, preserved, and available for future use by medical professionals. These managers typically work for healthcare institutions, such as hospitals and small medical practices. They help plan and implement programs and services at these facilities. In addition to managing patient information databases, these professionals may formulate day-to-day business strategies, hire new employees, and train personnel. They must also stay current on best practices related to medical procedures and equipment. These roles require both research and communication skills. Specialists in human resources often focus on a particular task within the human resources department. From payroll, training, and compensation to employee recruiting and customer service, these professionals communicate with all levels of personnel within a company. They may also assist the HR department with annual employee reviews, terminations, or audits from the government. In the day-to-day office environment, these professionals usually act as the first point of contact for employee needs. These individuals work closely with patients who need to make adjustments to their lifestyles, living situations, or healthcare. They can be valuable sources of information on services, home healthcare groups, and support groups for patients battling illnesses and diseases. These professionals also help doctors and other healthcare providers understand how illnesses and the subsequent changes in their lives affects patients’ health. Health educators promote healthy lifestyles for patients and communities. They primarily work in healthcare facilities such as hospitals and wellness centers. These professionals provide preventative health and practical education on a wide range of topics, including drugs and alcohol, diseases, emergency procedures, and pregnancy. Most educators work standard business hours. The salary and job outlook differs for medical records and health information technicians based on several important factors, and especially geographic location. Locations with a high demand for your skillset and career tend to offer more lucrative and diverse opportunities. According to the U.S. Bureau of Labor Statistics, South Dakota, Montana, and West Virginia have the highest concentrations of medical records and health information technicians, while New Jersey, Alaska, and California pay the highest wages. Curriculum requirements, electives, and course availability vary between online bachelor’s degrees in healthcare administration. Prospective students searching for a particular focus, minor, or concentration within a degree should check with their schools directly. Students can sometimes use their elective credits to take courses listed in other departments. Contact your prospective department directly with any questions on course availability or cross-listed courses. The below list includes common courses students can expect to encounter while earning a health administration bachelor’s degree online. Students new to the field must learn the essential marketing skills healthcare leaders use daily. They explore common practices in marketing, develop campaigns, and evaluate the effectiveness of your efforts. Students focus on leadership, group dynamics, culture, politics, and power dynamics in the workplace and other organized groups. This type of course is essential for those pursuing managerial positions upon graduation. This class gives a historical overview of the events that shaped the regulatory landscape of healthcare practice today. Students work on decision-making using models for appropriate healthcare and services. They also apply these ethical principles to real-world scenarios. Students learn financial management foundations as they relate to the delivery of healthcare services. They explore essential processes such as financial reporting, reading statements, figuring operational and capital budgets, and assessing financial risk. Students study the structural components of the healthcare system, including public and private third-party payers, regulators, reimbursement methods, long-term care services, and public health services. Students also learn about which financial systems keep healthcare services, such as ambulatory services and hospital systems operational. When choosing a school, make sure to consider the professors and resources available in your prospective department. Schools that invest in tenured professors, have solid research or teaching track records, and make concerted efforts to offer a variety of student support services and academic labs tend to offer a high quality of education. The value of your degree partially depends on your school’s reputation and its accrediting body. The section below answers common questions from prospective health administration students. How long does it take to complete a bachelor’s degree online? Program duration relies on several factors. In most cases, full-time students can complete their bachelor’s degrees in four years or less. Transfer students with previous college credits may be able to finish in less time. Some schools allow you to transfer 90 credits or more toward a bachelor’s degree. Part-time distance learners tend to take longer than four years to complete their bachelor’s degrees, depending on their course load. How will I know if I will be a good fit in a program? Prospective online health administration students should look closely at potential schools’ course offerings and the faculty members in each department. Each program has its own strengths and weaknesses, and each school’s course offerings and faculty indicate what’s important to that department. Students should consider each program’s available concentrations and standout classes. If your academic interests align with those listed in professors’ biographies and courses’ descriptions generally fit well in that department. How will a degree help me reach my goals? Outline your academic and career goals, and consider exploring the U.S. Bureau of Labor Statistics website or PayScale to help determine whether a bachelor’s degree in health administration would provide you with the credentials you need. Moreover, if you wish to pursue a niche area in the field, make sure your prospective school has the teachers and resources to prepare you for that position. Some health administration programs let students take a wide range of electives to help them tailor their degree. However, try to find a bachelor’s program that builds your desired specialty into the major curriculum. Which organizations provide accreditation to online health administration degree programs? All of the ranked schools on our list are accredited institutions. Regional accreditation is the golden standard for colleges and universities in the U.S. Moreover, health administration programs may have program-specific accreditation from the Commission on Accreditation for Health Informatics and Information Management Education or the Commission on Accreditation of Healthcare Management Education. Should I focus on developing specific skills while working on my degree? Students should seek programs that meet their academic preferences and would adequately prepare them for their future careers. Certain skills can make a graduate more attractive in the job market, and potentially raise their earning potential. According to PayScale, strategic, program, and budget management skills can increase graduates’ earning potential by 42%, 42%, and 22%, respectively. All students seeking online health administration degrees should exhaust all opportunities for financial aid. You can seek out funding opportunities through your school, or from scholarship foundations through public and private organizations, individuals, and families. Remember, scholarships and grant money do not have to paid back. If you meet award criteria, submit an application. This award caters to undergraduates enrolled in 12 credit hours or more per semester. The $2,000 is for those studying environmental or occupational health or safety, and related disciplines. As part of the Association on American Indian Affairs, this $1,500 award goes to students of federally recognized tribes who are working toward degrees in public health, healthcare administration, or a related field. Applications should include a tribal ID, college transcripts, and a personal essay. This $5,000 scholarship caters to full-time students enrolled in a program accredited by a healthcare programmatic accreditation body. Applicants must submit a letter stating their career goals, a resume showing employment history in the healthcare field, and three letters of recommendation. This $2,500 award is reserved for aspiring healthcare management or administration leaders. Applicants should be enrolled at a Commission on Accreditation for Health Informatics and Information Management Education-accredited program, taking at least six credit hours each semester. Applicants must also have a current American Health Information Management Association membership, 24 credit hours or more completed toward their degree, and leadership experience in healthcare. This $10,000 merit-based award is for students pursuing careers in healthcare. Students must submit answers to two essay questions, show proof of leadership activities and community involvement, and display academic evidence.